Our rates vary by boat type, season, and holidays. Please fill out our brief form below and we will provide a custom quote with availability. Alternatively, you can call us anytime at 844-243-5707. You'll probably want to upgrade to live bait if you're hunting for the big boys (sailfish, swordfish, etc.) Live bait is approximately $80, which is the price the captain has to pay to buy it. Holy Mackerel! 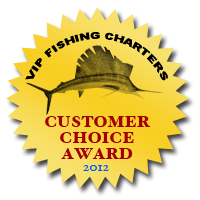 Our center console fishing charters now include live bait for no additional charge. Thanks Captain Ryan! Feel free to bring your own and put it in our cooler. Or, ask us about our catering options. We can arrange sandwiches, snacks, drinks and beer for about $35 per person. It's generally a few degrees cooler on the water and there's no such thing as a totally dry spot on a boat. Better to come overprepared than underprepared. We recommend a windbreaker/ rain jacket just in case. If you're not sure, give us a call the day before the trip and we'll check on the weather for you. Plans change. Sh!t happens. We get it. We collect a deposit at the time of booking to reserve your trip. If you need to cancel your trip, you may do so 72 hours or more in advance and we will refund every penny of your deposit. If you need to cancel within 72 hours, we'll hold on to your deposit and apply it to a future trip up to one year from your initial booking. The Sunshine State has its name for a reason. We heard Colorado has more days of sunshine than Florida, but there ain't any sailfish there so who cares. Occasionally mother nature doesn't cooperate. In this case it is up to the captain to cancel the trip. If the captain cancels the trip, we'll try to reschedule for another day, or if we can't make it work for you, we'll refund your deposit.